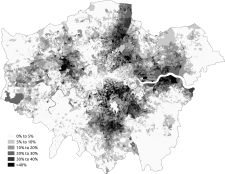 Population density in the 2011 census in Greater London. 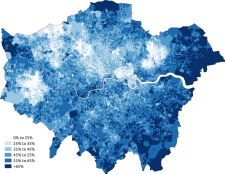 The demography of London is analysed by the Office for National Statistics and data is produced for each of the Greater London wards, the City of London and the 32 London boroughs, the Inner London and Outer London statistical sub-regions, each of the Parliamentary constituencies in London, and for all of Greater London as a whole. 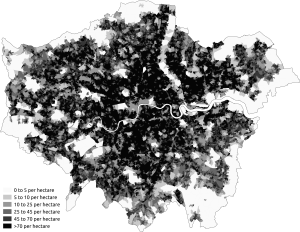 Additionally, data is produced for the Greater London Urban Area. Statistical information is produced about the size and geographical breakdown of the population, the number of people entering and leaving country and the number of people in each demographic subgroup. This table shows the proportion of races by London borough, as found in the 2011 census. The following table shows the ethnic group of respondents in the 2011 census in Greater London. 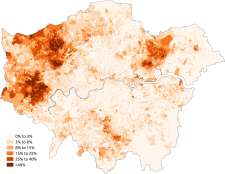 In January 2005, a survey of London's ethnic and religious diversity claimed that there were more than 300 languages spoken and 50 non-indigenous communities with a population of more than 10,000 in London. Distribution of ethnic groups in Greater London according to the 2011 census. The 2011 census recorded that 2,998,264 people or 36.7% of London's population are foreign-born (including 24.5% born in a non-European country) making London the city with the second largest immigrant population, behind New York City, in terms of absolute numbers. The table to the right shows the most common countries of birth of London residents. Note that some of the German-born population, in 18th position, are British citizens from birth born to parents serving in the British Armed Forces in Germany. According to the 2011 Census, 6,083,420 or 77.9% of London's population aged 3 and over spoke English as a main language, with a further 1,406,912 (19.8%) speaking it as a second language or well to very well. 271,693 (3.5%) could not speak English well, while 47,917 (0.6%) could not speak English at all. 2,456 (<0.1%) spoke other UK minority languages, with the most common being Welsh and 2,926 (<0.1%) used British Sign Language. This shows also great challenges for TfL and other government services, for example most ticket vending machines use only English, French and up to 2 other western Europe hemisphere languages, while as shown below most demand is for Indian languages, Polish etc. The most common main languages spoken in Greater London according to the 2011 census are shown below. The following table shows the religion of respondents in the 2001 and 2011 censuses in Greater London. 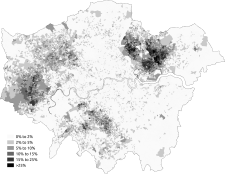 Distribution of religions in Greater London according to the 2011 census. At the 2001 census, the population of the Greater London Urban Area was 8,278,251. This area does not include some outliers within Greater London, but does extend into the adjacent South East England and East of England regions. In 2004 the London Plan of the Mayor of London defined a metropolitan region with a population of 18 million. Eurostat has developed a harmonising standard for comparing metropolitan areas in the European Union and the population of the London Larger Urban Zone is 11,917,000; it occupies an area of 8,920 square kilometres (3,440 sq mi). Another definition gives the population of the metropolitan area as 13,709,000. ^ "London through time: Population Statistics: Total Population". A vision of Britain through time. Great Britain Historical GIS. Retrieved 19 November 2009. ^ "Outer London through time: Population Statistics: Total Population". A vision of Britain through time. Great Britain Historical GIS. Retrieved 19 November 2009. ^ "Inner London through time: Population Statistics: Total Population". A vision of Britain through time. Great Britain Historical GIS. Retrieved 19 November 2009. ^ "1991 census – theme tables". NOMIS. Retrieved 20 January 2017. ^ Benedictus, Leo (25 January 2005). "Every race, colour, nation and religion on earth". The Guardian. Retrieved 22 August 2009. ^ Kyambi, Sarah (7 September 2005). Beyond Black and White: Mapping New Immigrant Communities. London: Institute for Public Policy Research. ISBN 1-86030-284-X. ^ a b "Proficiency in English, 2011 (QS205EW)". Office for National Statistics. Retrieved 17 April 2013. ^ "Main Language (detailed), 2011 (QS204EW)". Office for National Statistics. Retrieved 17 April 2013. ^ "2001 census – theme tables". Retrieved 5 September 2014. ^ "Religion by measures". NOMIS. Retrieved 2 September 2014. ^ "KS01 Usual resident population: Census 2001, Key Statistics for urban areas". Office for National Statistics. Archived from the original on 11 March 2005. ^ Mayor of London. "The London Plan". Greater London Authority.